Preheat oven to 375 degrees F. Coat the bottom and sides of a 9-inch pie plate or quiche dish with cooking spray; set aside. With the tip of a sharp knife, scrape seeds from vanilla bean. Place seeds in a small saucepan; add evaporated milk and the vanilla bean pod. Bring to simmering over medium heat; remove from heat. Let stand, uncovered, 15 minutes. Discard vanilla bean pod. In a blender or food processor combine eggs, flour, sugar, melted butter, vanilla extract, and salt. Add milk mixture. Cover and blend or process until combined. Arrange the sliced apricots in the prepared dish. 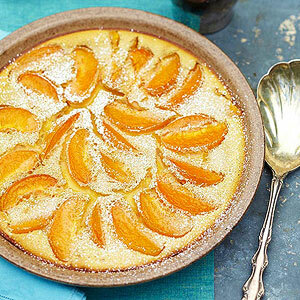 Pour batter over apricots. Bake 25 to 30 minutes or until puffed and light brown. Cool in dish on a wire rack 15 minutes. Sift the powdered sugar over top. Serve warm. *SUGAR SUBSTITUTE: Choose Splenda Sugar Blend for Baking. Follow package directions to use product amount equivalent to 1/4 cup granulated sugar. PER SERVING WITH SUBSTITUTE: Same as above, except 133 calories, 15 g carbohydrate, 10 g total sugar.